The US-UK Fulbright Commission was founded by diplomatic treaty in 1948, to foster intercultural understanding between the United States of America and the United Kingdom of Great Britain and Northern Ireland through educational exchange. 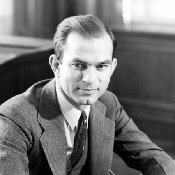 Senator J William Fulbright (1905-1995) believed in the value of peace and prosperity as a result of cultural immersion. He created a global educational exchange programme to support this vision. At the Fulbright programme's heart is the belief that those who experience another culture will have a deeper understanding of the world and be able to contribute to "joint ventures for mutually constructive and beneficial purposes". They will have enhanced their professional skills and academic knowledge, and acquired empathy as global citizens. The US-UK Fulbright Commission continues to support Senator Fulbright’s vision through our scholarship and summer programmes, enabling British and American citizens to study, research or teach at universities on either side of the Atlantic. There have been over 27,000 Fulbright exchanges between our two countries so far. As part of the EducationUSA network, we also offer British students free, accurate, and comprehensive information about opportunities to study at accredited universities in the USA. We organise USA College Day, the largest US university fair in Europe. There are currently 11,600 British students at American universities. We look forward to supporting your US-UK educational experience.